Backpacks, Regional Meeting, Social Media, Food galore, International Women's Day, Laughter is the Best Medicine! 22nd March – Our last social meeting of the year proved to be a real tonic, with our speaker, Dennis Moore, demonstrating with many hilarious stories, that Laughter is indeed, the Best Medicine. 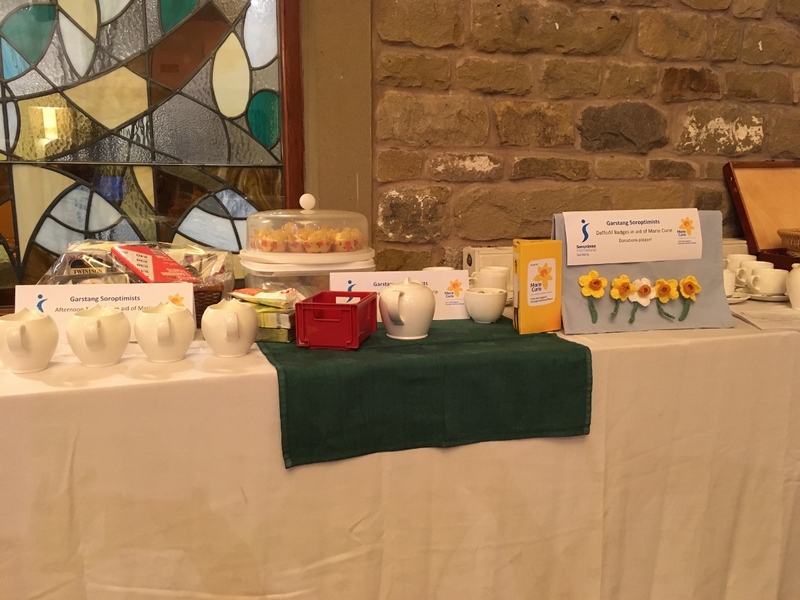 13th March – This was swiftly followed by Pendleside’s Friendship Evening, where we were provided with delicious hotpot and Pavlova. Yes, you can see the weight piling on! 12th March – Then it was Blackburn’s charter Lunch, with the usual mix of fun, food and friendship, and a speaker who told us about the organisation that supports children with their literacy – a subject very close to the heart of President Annemarie! 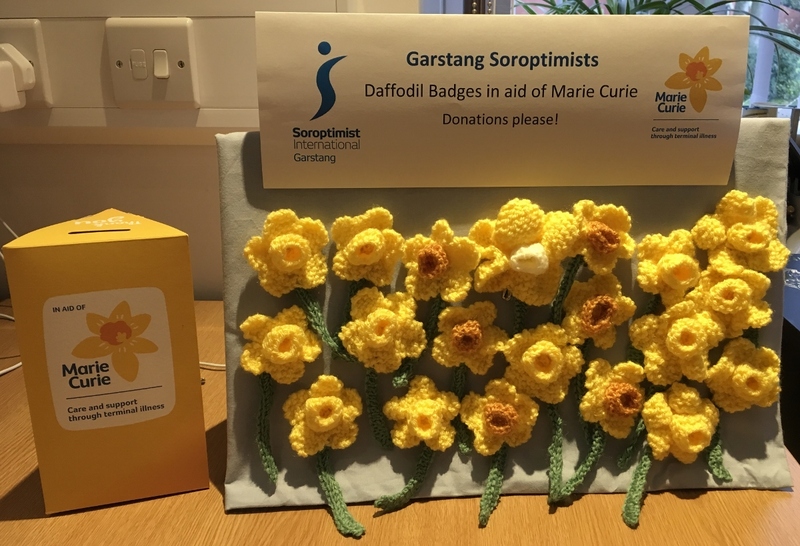 8th March – We had a very successful celebration of International Women’s Day, selling 44 of Joan’s cleverly knitted daffodils, raffle tickets for the hamper donated by Ruth, and cakes with a ‘yellow’ theme baked by Lesley, all in aid of the Marie Curie Daffodil appeal. A total of £223 was raised for this very worthwhile charity. 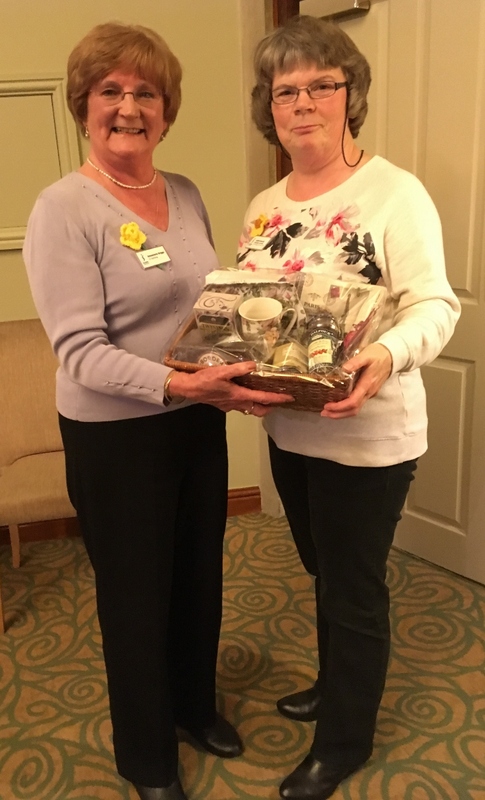 5th March –Well this month has truly been a social whirlwind for President Annemarie! She attended Preston Charter Lunch along with fellow club member Ruth Bruce, and they enjoyed some very amusing entertainment by the Preston club members – a very talented group! 22nd February – What an enjoyable night this was, although the chef might have preferred some prior warning about the numbers that were going to descend on him demanding food all at once! After a pleasant meal, we trooped through to the waiting ‘classroom’, ready for a further social media training provided by Joan. She took us through the process of signing online petitions (we had the thrill of watching our names come up on the list as our signatures were verified!) and then moved on to Facebook. She showed us how to access our privacy settings and like, comment and share posts. And then the tricky bit about having ‘friends’ and what they can see if you do have them. She pointed out buttons and drop down menus that I would never have seen in a month of the proverbial Sundays! And finally we were encouraged to find and like the Garstang and the Regional pages and like, comment and share, on those. 18th February – 9 of our members attended the first of the Regional meetings for 2017 at Lancaster University, with several extremely interesting and informative presentations. February – After one of their teachers read about it in the Focus magazine, the pupils of St Francis Primary School in Goosnargh collected an amazing 29 backpacks for Garstang Soroptimists’ Backpack Project, and filled many of them with essential school items, in just half a term! They also donated 3 large bags of clothes to help fill the bags. Their response was so enthusiastic that their donations filled the whole of the back of the car when their teacher brought them to us. 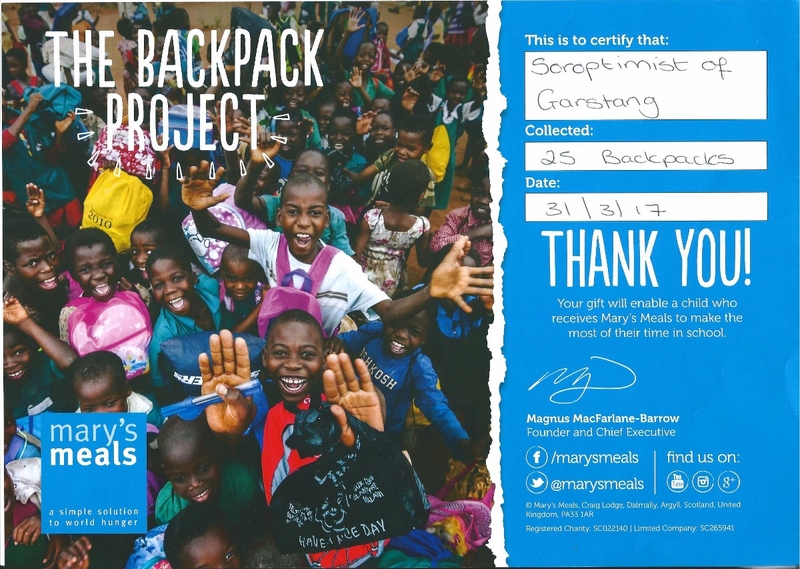 The Backpack Project is linked to a project called Mary’s Meals, which provides a daily meal in a place of learning to attract chronically poor children into the classroom, where they receive an education which can set them free from poverty in later life. It is a simple way of helping children from poor families in countries like Malawi and Liberia get to school. Very often the parents cannot afford to buy even basic things like pens and notebooks or even suitable clothes for their children to wear to school. And so their children miss out on school and the education that can help them escape from poverty when they grow up. We are so fortunate that our children have a good education as a right, and this is a way in which the pupils of St. Francis’s school have now helped other children have the same opportunity, to lift them out of poverty.